CCC's Gran Turismo 5 Prologue Launch Site: Reviews, Previews, Cheats, Videos, Screenshots, and more! Ready for the best racing simulator of all time? 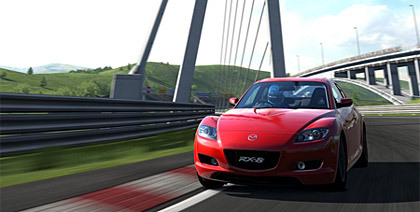 Let Gran Turismo 5 Prologue bring all the power to your PS3! Look below for cheats, videos, screenshots, articles, and more! Gran Turismo 5 Prologue has over 70 different cars available: Audi, Ferrari, Aston Martin, and many more! Gamers can experience Drift Mode, Car Tuning, two-player split screen racing and a new set of offline and online Race Events. For the first time in the GT series, up to 16 players can compete online. Ready to get the most out of Gran Turismo 5 Prologue? Don't forget to check out our cheats section, where you'll find cheats, tricks, hints, and everything you need to know about secrets and unlockables included in the game. Keep checking back for more!